Calendula Pacific Beauty Calendula Officinalis is an old English cottage garden flower that is native to the Canary Islands, South and Central Europe, and North Africa. Calendula Pacific Beauty can be easily grown from seeds. Also called Pot Marigold this cool weather annual plant produces 5 inch in diameter, double, daisy-like, bright-orange and yellow flowers. Calendula performs satisfactorily in all conditions except deep shade and extreme heat. In warm climates, Calendula blooms through the entire season, and in cool climates, it will bloom in spring and early summer. Calendula Pacific Beauty looks great in mass planting, borders, parking strips and containers. prefers full sun locations. Calendula Officinalis seeds can be planted in early spring as soon as the soil can be worked, and in warm climates the seeds can be planted in late summer or early fall for winter and spring bloom. Calendula plant is very adaptive to soils types, as long as it grows in well drained soils. The soil should be kept moist but not soggy. 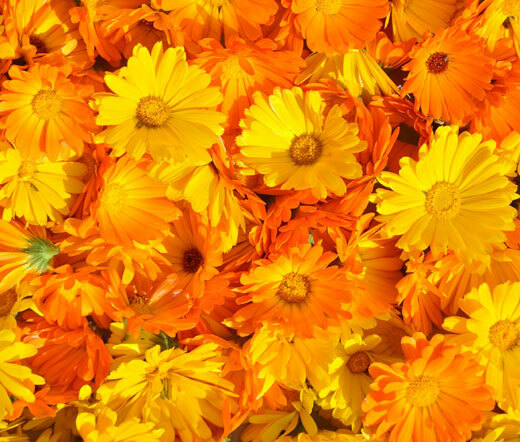 Calendula is used for medicinal and culinary purposes, and its petals, with their slight aromatic bitterness are used in fish and meat soups, rice dishes, salads, and as a coloring for cheese and butter. Calendula heals wounds as well as internal and external ulcers. It is an antiseptic, and improves blood flow to the affected area. As an antifungal agent, Calendula can be used to treat athlete's foot, ringworm, and candida. The tincture applied neat to cold sores encourages healing. Calendula Pacific Beauty is a great, long-lasting cut flower.